What could be scarier than some fake spider webs and a leering jack ‘o’ lantern this Halloween? For millions of Americans, the answer seems to be a bare front porch and undecorated home totally lacking in spirit. In 2007, nearly 50 percent of Americans decorated their homes or yards for Halloween, according to the National Retail Federation’s Halloween Consumer Intentions and Actions survey. The survey estimated total Halloween spending, including decorations, at around $5 billion last year. Many serious Halloween acolytes add one or two major items of decoration to their collections every year. Larger pieces, especially those that feature movement, light or sound, can cost hundreds of dollars. But it’s possible to create a fresh, fun or even frightful atmosphere with a cost-effective, timeless decorating tool – cut flowers. 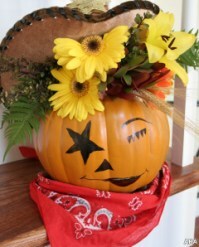 Flowers are especially versatile as Halloween decorations because they can be used to create fun or frightening effects. Whatever the atmosphere you plan to evoke, remember that color is key. For scary effect, choose cut flowers in powerful colors like blood red, or ghostly white. Crimson roses, lightly laced with somber white genistra and presented in a creepily cracked urn can make a frightfully good -- and eerily elegant -- decoration for your grown-up Halloween display..
For fun arrangements, choose seasonal colors like golds, yellows, oranges and burnt umber. Accent seasonally hued floral arrangements with harvest-themed extras like dried corn husks, wheat stalks or gourds. 1. Soak floral foam for at least 30 minutes in water treated with flower food/preservative. 2. Cut and scoop out pumpkin. With permanent marker, draw eyes and nose of Spooky Sheriff. 3. Cut the wet foam to fit and insert the floral foam into the pumpkin. Set the cowboy hat on top of the floral foam. 4. Cut flowers and foliage to approximately 4- to 6-inches in length. Begin inserting stems under the cowboy hat and into the exposed floral foam. Place the colorful yellow lily and yellow gerbera daisies front and center and position the dried wheat and orange gerbera daisies to one side. The protea and sword fern are used to fill spaces of the bright flowers. 5. Tie the bandana around the base of the pumpkin. 1. Soak one brick of floral foam for at least 30 minutes in water treated with floral preservative/food. 3. Cut the pin-cushion protea to about 2-inches in length and insert it into the center of soaked floral foam. 4. To make the spider legs, cut the pipe cleaners in half. Then shape them by wrapping around index finger. Insert the pipe cleaner legs into the floral foam surrounding the flower at spaced intervals. 6 legs are used for each spider. 5. Adhere eyes onto the flower using the glue gun. 6. Repeat steps two through five to create the orange standard carnation spider in the other clay pot. 7. Cut dry brick of floral foam to fit inside of the basket, and place securely inside to use to prop up accessories and your floral creations. 8. Cover dry floral foam with colorful bunny grass and set one Floral Creepy Crawler inside the basket and the other just outside. 9. Sprinkle Halloween candy throughout the bunny grass.